It may be an incredibly late addition, but CrowdStar has added a series of Spooky Quests to Happy Island, allowing users to win four Halloween themed rewards. These quests will have you ghost hunting and treat collecting. Meet us behind the break for more details of how to complete these spooky quests. The first quest you can come across is Ghost Bustin', which has you busting 10 Ghosts (simply click on them). These ghosts can be found floating around your island, but you'll need to be fast at catching them, as each ghost goes in and out of transparency at a pretty fast rate, meaning that you won't have long to click on each ghost before it disappears again. Your reward for this quest is a Spirit Stone decorative item. 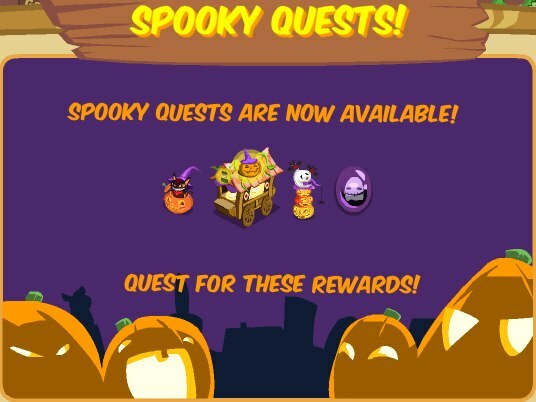 The second and final quest is the Trick or Treat quest. 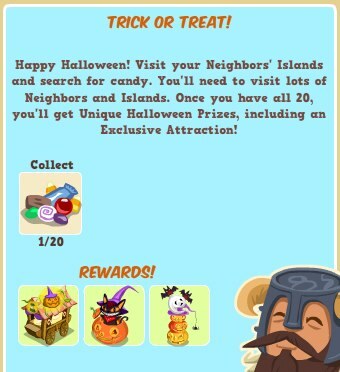 This quest asks you to travel to your neighbors' islands and search for candy. You'll need to find 20 pieces of candy in all, which is actually much easier said than done. The quest description itself even says that you'll need to "visit lots of Neighbors and Islands," with this being due to the fact that when you visit a neighbor, lots of candy items will appear on the beach, but most of them will be fake, trick items, and only a few (one or two, or more if you're extremely lucky) will be treats. Luckily, you can visit each neighbors' island more than once, and see that the candy pieces have re-spawned on their beach. This means that any player, so long as they have a single neighbor, will eventually be able to complete this quest, but it will be a time consuming process either way. Once you have collected all 20 pieces of candy, you'll be rewarded with the other three themed rewards - two decorations and one attraction: a Cat-o-lantern, Haunted Pumpkin Stack, and Wicked Wagon, which are only available to earn through this quest. Check out the rest of our Halloween 2010 coverage right here. WIll you take the time to complete these Spooky Quests in Happy Island? Sound off in the comments.